The Focus ST is a great hot-hatch. The problem is the styling minces no words about what that car can do, so you end up with all kinds of bros trying to race you on your commute. 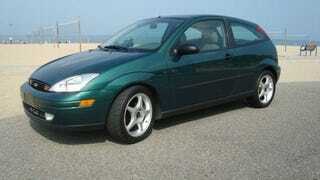 Now if you want something that blends in, but can lay down some serious rubber, check out this RWD converted V8 Focus. The owner claims upwards of $34000 have been invested to make this mean green machine. The car was built by Tee's custom cars in FL and has numerous mechanical upgrades including a rear drive conversion, suspension, and electronics components, but topping it all off is a Ford 302 cu/in crate motor putting out 340 horsepower. Original car had 90K light highway miles. It was a 2000 purchased in the fall of 2002. The body and interior are all stock and in excellent condition. All original paint no dings no scratches, not even a hint of rust anywhere. A couple easy years on the road in Florida and has been in a garage year round since conversion. Never raced, only local car shows. There are so many cars running around with silly wings, stickers, and fake badges all in an attempt to make the car "seem faster." I don't know who these people are fooling, but I'm always happy to come across a serious car that is all about the "go" instead of the "show."